obsessed with knitting: dk? what is dk? Next Project: The last post ended with me thinking about what to do with 14 balls of Knit Picks Merino Style dk yarn, color vanilla. 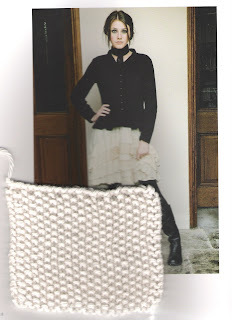 I thought about the Minimalist Cardigan from Interweave Knits Fall 07 issue. This, in my judgment, is the best design from that issue. I love moss stitch (or in this case, double moss stitch called moss stitch). But I am not sure that I would like this as much in white, and I would need to think in order to make the shape more swingy-- or should it stay straight? Too much to think about. I just want to cast on and do it. Plus, in looking at other knitter's results in Ravelry, I can see that fit is absolutely crucial in this design. Again, too much to think about, especially since the fit is kind of unconventional ; that is, should it meet comfortably in front or not? I will knit this eventually, but not in Merino Style. I think I would like it better in Berroco Ultra Alpaca. Hard to see from this photo, but this is a squarish moss stitch jacket with a simple fold back collar, waist shaping, and a flounce at the bottom which goes longer at the back. Below the jacket is a scan of my tension square which gets the stitch gauge perfectly. So I cast on for this last night, while watching Colin Firth. In the interest of completeness and full disclosure, I should note that I have substituted a wool yarn for cotton. Normally I don't like to do this, but I can't see how this jacket could not work out in wool. The elastiticy of the stitch work would probably make the cotton behave more like wool anyway (I hope). Wraps Per Inch: Now I come to the main subject of this post, What is DK? I was flummoxed by the difference in size between Merino Style DK and RYC Cashsoft DK. They were so different knitted up that I wondered why both were called DK. I have a special wraps per inch (wpi) measuring stick, so I measured both yarns and found that the Knit Picks yarn measured 11 wpi and the RYC 12 wpi. Does this difference mean that one is DK and one is not? Now I thought that wraps per inch was the most accurate way to measure yarn thickness. But I guess not. In measuring for myself, I also saw that the results could be skewed by wrapping a little looser or a little tighter, although I tried to do it perfectly. I am, however, willing to call the Knit Picks DK because it knits up at the right gauge for Mrs. Darcy, which calls for a DK weight Rowan yarn. In stockinette, the Knit Picks also comes to a DK weight, 5.5 stitches per inch on # 6 (rather than #5) needles. I just think that Knit Picks Merino Style is a little horsey. As such it does have the substance needed for this design. In conclusion, I would say that yarn measurement cannot be exact. I know that the important thing is getting the correct gauge, but I would still like a way to measure. Actually, I like the Nancy's Knit Knacks chart best because it gives a range of measurements for each weight, giving you an idea of the yarn size, but not exactitude. And that seems to reflect the reality. 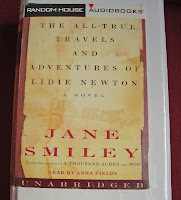 A Book and a Tip: The audiobook I am currently listening to while I knit is The All True Travels and Adventures of Liddy Newton by Jane Smiley. This is set in the Kansas Territory in the 1850s, before the Civil War, where abolitionists and Southerners came to battle over whether or not the new State of Kansas would be a slave state. The narrator is a 20-year-old woman from Quincy, Illinois who met her Northeasterner husband as he came through Quincy on his way to Kansas with a load of contraband rifles to aid the abolitionist cause. I do not normally read historical fiction (although I don't hate it at all), but I like Jane Smiley, who is an amazingly eclectic novelist, taking up all kinds of subjects. She is a wonderful and versatile prose stylist, but she is weak on plotting. I have liked her novels, but haven't been able to quite finish some of them. This one is weakly plotted as well, but the action is interesting in itself. I hope to finish it. Here is a little tip for knitting lace by Cheryl Oberle. I like lace patterns in words rather than charts, which are hard for me to read. To make a bunch of words easy to follow, the author suggests writing each line of knitting on a separate card and flipping the cards to follow the pattern. It works great for me. I am using it with the Kimono Shawl, which I am still working on. Thanks for you nice comment on my blog. I hope that the rain stays away from high hideous winds and other such stuff! Yes, I think it is fisherman's rib. Thank you! That name rings a very big bell, now. I picked the pattern out from a book and plugged it in to a stockinette. I felt very daring at the time but it worked out. About suggested needle sizes in patterns. I usually have to go down three sizes to make the gauge. The only time I don't, of course, is when I haven't got the right sized needle anyway. The solution over the years has been to buy, buy, buy all sizes until there's nothing left to buy. Knitting and Colin Firth, it's enough to make me swoon! As a handspinner, I have problems with how commercial yarns label their yarn. I am currently doing a sweater in a wool / silk blend and it took a lot of figuring, but the yarn I am using is the same diameter as the yarn called for, but it is almost twice as long per ounce so I only need 10 skeins, not 20. Different fibers have different mass, so I would just flat out prefer yarns to list things in terms of WPI instead of grams and yards. It makes it so confusing when you substitute.